I bought Magenta Divine a little while ago when Models Own had their 50% off sale. It's a hot pink glitter polish that can be easily layered up to opaqueness. I've been looking forward to trying it out, but as the weather has gotten colder, I wanted to find a way to make it wearable in the daytime, as it's a pretty full on look. So here's where Essie's Chinchilly comes in. One of my favourite latest purchases, I've been wearing Chinchilly a lot. 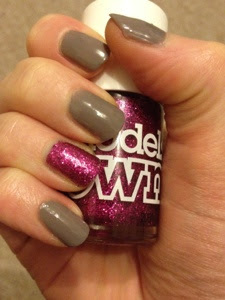 I decided to use Magenta Divine as an accent nail on each hand and the finished look is below. It took me three coats of Magenta Divine to get to this look, but i'm really pleased with how it turned out. The polish is really fast drying, so doing three coats wasn't too painful! As always, Chinchilly went on smoothly and was opaque in two. I'm really enjoying this little flash of colour to rebel against the dull weather at the moment. 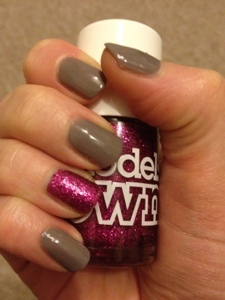 I think Models Own polishes are great value - they retail for £5 each, and have really good, long-lasting formulas. You can buy them from larger Boots stores, or via their website. This is gorgeous! So girly! Thats such a nice colour! check out my blog to find out how to enter two giveaways! I agree, it's made me smile today despite the rain and grey skys. Shu Uemura eyelash curlers - worth £20?